Granite Bay Flycasters as well as federal, state, and local governments. 2006, and redds dropping from 84 in 2004 to 43 in 2006.
concepts of interdependence and food webs. local creeks flowing into the larger watershed system. Concentration,” the “I Care For Creeks” game and making a take-home creek food chain. asked when we would be back. 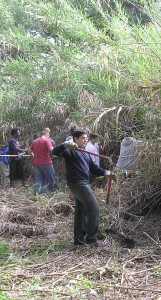 their learning to new situations better in environment-based education programs. please call the Effie Yeaw Nature Center at 489-4918 ext. 237.
waterways caused by the improper disposal of pet waste in our parks and trails. District: Hamilton Street, Oakdale, and Arcade Creek Park, as well as Holyoke Trail. and generates many public complaints. to use for picking up and disposing of pet waste. build connections within the community. forms that come to the surface to breathe. appreciate their unusual place in Nature. Historical Overview of Sacramento's Creeks. in the Arcade Creek watershed? creeks to their former roles in the production of salmon? (wtemplin@surewest.net ) and let's get started! As much as you might think that those mourning doves that you see in your back yards are locals, many of them are probably migrating from as far north as Canada in the late summer and up from Mexico in the spring. Mourning doves, like ducks and geese, are migratory game birds regulated by the Migratory Bird Treaty Act of 1918. We don't think of doves as migrating because we don't see massive flocks of them flying in "V formation" like waterfowl, but people spend their entire careers documenting this phenomenon. For example, Karen Fothergill kfothergill@dfg.ca.gov is our local California Department of Fish and Game Wildlife Biologist in charge of California's part of the U.S. Fish and Wildlife Services' "Mourning Dove Call-Count Survey." 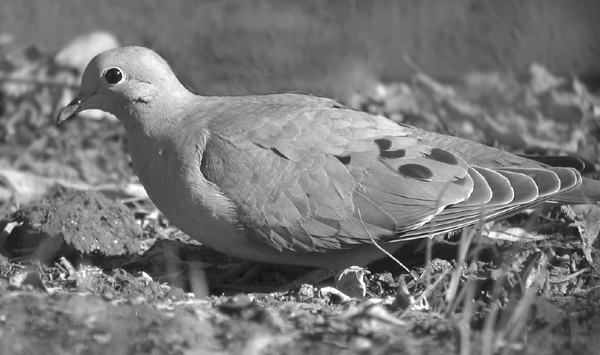 This survey was developed to provide an index to population size and to detect annual changes in mourning dove breeding populations in the U.S. The survey consists of numerous routes throughout the U.S., which are surveyed in late May and early June. The resulting estimates of relative abundance and population trends comprise the principal information used in the annual setting of mourning dove hunting seasons. noting on the calendar how many doves you see each day. What is the Problem with Arundo? shrubs provide food and nesting sites for native animals. animals do not eat Arundo and birds will not nest in it. Where does Aundo Come From? How Can Arundo be Eradicated? 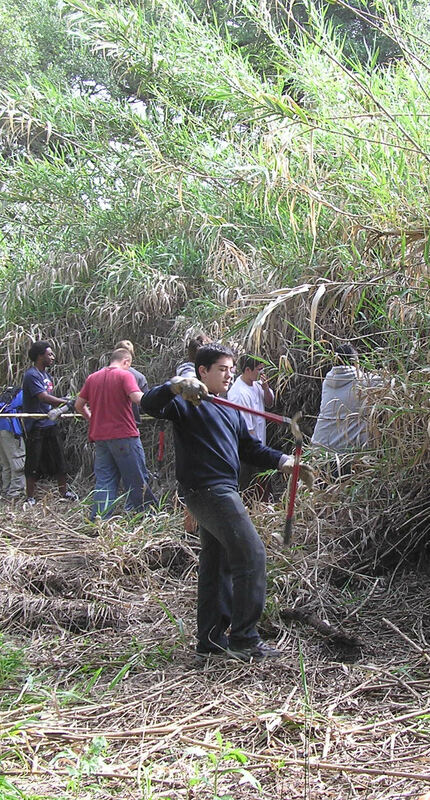 Arundo in Sacramento area creeks and the upper American River. stalks and haul the slash away from the flood channels. an herbicide to kill the thick rhizomes (root system). to be certain that no resprouts appear. A favorite activity of my childhood was collecting big “red ants” (Pogonomyrmex sp. harvester ants) and creating ant habitats in a jar so I could watch them forage and dig. Even better, a friend of mine had his very own red ant colony just outside his kitchen door. Every afternoon, as the fence’s shadow fell across the colony entrance, the red ants would plug the hole, and a few colony members would be left outside. That’s when a swarm of small “black ants” would come in and attack the stragglers. Years later, I learned that the black ants (really a dark brown) are Argentine ants, officially known as Linepithema humile. I’m writing about them in Creek Watch because they are linked to one of the most significant pollution problems in urban creeks. It turns out that efforts to control Argentine ants with pesticide sprays have resulted in toxic amounts of pesticides in urban creeks all over California. Until a few years ago, the pesticides diazinon and chlorpyrifos were used extensively for ants around homes, and were found at toxic levels in creeks almost every time water quality agencies looked for them. Now that these pesticides have been phased out, we are finding their replacements, pyrethroid pesticides, at toxic levels in sediments in many urban creeks. Stormwater agencies are working hard to let people know about effective alternative methods for controlling Argentine ants in and around their homes. “Argentine” reflects the fact that these ants originated in South America. An invasive species in California for over 100 years, they have few natural enemies and are responsible for aggressively displacing native ant species. They are spreading almost unchecked in urban areas and irrigated agricultural lands. In the Sacramento Valley, indoor swarms occur mainly when the weather gets really hot outdoors or when it starts to rain. Both of these conditions encourage the ants to seek more favorable conditions indoors. In the summer they run out of honey-dew outdoors and come indoors looking for food and water. In the winter, they are seeking shelter from rain and cold. I really like insects, but I draw the line at the familiar black swarm covering virtually every square inch of the kitchen counter. So what will really work to get them out and keep them out of the house? First of all, spraying insecticides on ants indoors may kill those that you can see (less than 10 percent of the colony), but it is not an effective strategy for long term control, and results in unnecessary pesticide exposure for you. Likewise, spraying the perimeter of your home on a monthly basis for “prevention” is the primary source of pesticide toxicity in local urban creeks and is not the most effective method to control ants. The best method for immediate relief from the swarm in your kitchen is to use a spray of dish soap and water or citrus cleaner to wipe them up. To reduce future infestations, clean up food and water sources that are attractive to them. Exclude ants from your home by finding and sealing the cracks and holes where the trails are coming in. They will look for alternate routes, so this may take some patience and persistence. Some people choose to use insecticidal baits that are designed for ants, and they can be very effective while using a small fraction of the amount of pesticides that a spray would contain. Properly placed, pre-containerized baits will also reduce the chance of people coming in contact with the pesticide, or the pesticide being washed away down the storm drain. These methods do take some time and effort to be effective, but the end result is longer term control with less pesticide use. More information on ants can be found here. For those of you more inclined to hire out this type of work, the Sacramento Stormwater Partnership is participating in the development of a program called EcoWise, so that you can easily identify pest management professionals who can control ants using these techniques. EcoWise should be available by this fall, so keep watching Creek Watch and our website for future announcements, or you can contact me at 916 – 874 – 8024 for more information.